A small grower in the Santa Lucia Highlands started a new label with the 2011 vintage. Mansfield-Dunne Wines is the culmination of a ten year effort to secure land in the Santa Lucia Highlands with the goal of growing premium Pinot Noir and Chardonnay and produce wine from those grapes. 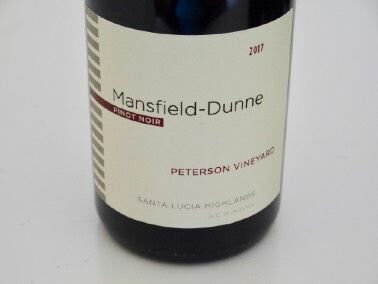 The second release is a 2011 Peterson Vineyard Santa Lucia Highlands Pinot Noir that comes entirely from the family owned estate Peterson Vineyard (239 cases). The vineyard is 8.8 acres planted to Dijon clones "828," 667, and 115, and Pommard 5. The winemaker is veteran Ed Kurtzman. The goal is to increase production to at least 500 cases. 1.1 acres of Chardonnay were added in 2011 at Peterson Vineyard, and a second property is under development in the Santa Lucia Highlands.